All said below is probably also true for for different OSs, but I used W7/U1404. A HDD connected to an UEFI motherboard is usually only using one single ESP partition. All installed OSs use the same ESP partition to store their respective bootloaders. However, there are situations where an ESP partition per installed OS is an advantage. In this scenario, U1404 image restoration also restores an outdated W7 bootloader located on the common EFI partition, hence creating possible W7 boot problems or other issues which might be related to this outdated bootloader. Also, future W7 updates won’t detect the outdated bootloader since for W7 update mechanisms, the update took already place. U1404 installation process doesn’t allow selecting an existing ESP partition the bootloader is supposed to be copied to. It simply uses the first EFI partition found in the GPT. An UEFI entry is also done accordingly, id est the U1404 UEFI entry points to this ESP partition. A existing second ESP partition is ignored by the U1404 installation process. Now … let’s move the /EFI/ubuntu (U1404 bootloader) directory from /boot/efi to /mnt/esp2. The UUID of /boot/efi is changed from /dev/sdb1 to /dev/sdb5. blkid tells us about the UUID. ## /etc/fstab: static file system information. This is how UEFI looks like before U1404 was installed. U1404 USB installation device was used to produce code block below. | --test filename    don't write to NVRAM, write to filename. -t | --timeout seconds  set boot manager timeout waiting for user input. -T | --delete-timeout   delete Timeout. This is how UEFI looks like after U1404 was installed. U1404 USB installation device was removed and HDD installed U1404 used to produce code block below. The only change is Boot0001. The U1404 USB installation device entry was replaced by the just installed U1404. Now, the bootloader is moved from /dev/sdb1 to /dev/sdb5 (point 1. above) and /etc/fstab adjusted accordingly (point 2. above). From now on, Boot0001 “ubuntu” doesn’t start U1404 anymore since it doesn’t find shimx64.efi – though it starts W7, which is somewhat unexpected! Nevertheless, Boot003 “UEFI: Samsung SSD 840 PRO Series” starts U1404. Hence … (a.) Boot0001 can be deleted and (b.) a new U1404 entry can be created if desired (since it doesn’t do much else than the existing Boot0003 entry). root@deimos:~# efibootmgr -c -d /dev/sdb -p 5 -L "Ubuntu 14.04" -l "\EFI\ubuntu\shimx64.efi"
After next reboot, Boot0003 entry was gone. 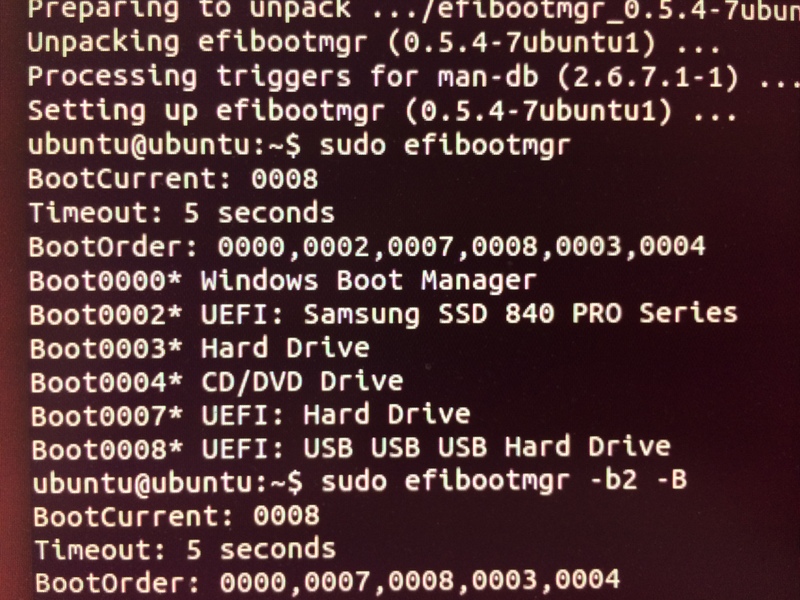 UEFI seems to detect at boot process that it is a double entry doing the same thing, and consequently deleting the self-made generic entry “Boot0003* UEFI: Samsung SSD 840 PRO Series”. Not bad! The W7 is my default OS, this is the optimal solution. If I would like to use U1404, I press F12 during boot process and the UEFI menu shows up and allows me to choose the boot device. Please comment and/or correct … Thanks!